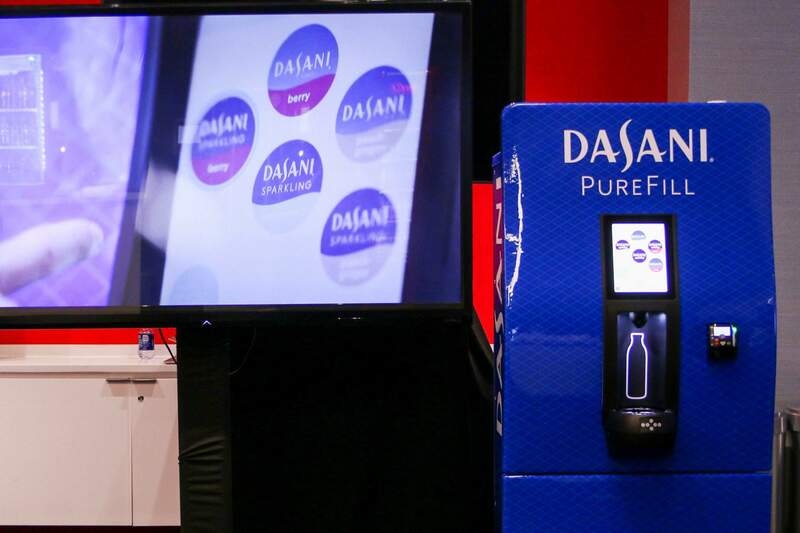 Coca-Cola’s “Dasani Purefill” machine, which lets people fill reusable water bottles with filtered water at no cost, but also offers the option of paying to add bubbles and flavors, is being tested on the campus of Georgia Tech. NEW YORK – Can a machine that dispenses water for free also turn into a cash stream for Coca-Cola? The world’s largest soda maker is testing a fountain that lets people fill reusable water bottles with free, filtered water – but also offers the option of paying to add bubbles and fruity flavors. It’s an example of how the maker of Fanta, Sprite and Powerade is searching for new ways to make money as Americans cut back on traditional sodas. “When they have these filling stations on campuses, there’s a loss of transaction, a loss of interaction with your consumer,” a Coca-Cola employee explains in a company video . For Coke and Pepsi, the growing popularity of water has posed a challenge. Even with plain bottled water – which both companies sell – the profit margins are generally not as high as on other drinks because people are not as loyal to a specific brand with water, and tend to buy whatever is cheapest in bulk cases.